Zhengzhou is the capital of Henan Province .Not far from Zhengzhou, there is a city with excellent history —— Luoyang. The name come from Luo River , Luoyang located on whose bank .I was born and live there .I‘d like to introduce my hometown. Been the capital of 13 dynasties, Luoyang is a famous city in China .All these dynasties has gong away, even I could not tell which all the 13 dynasties were. If you want learn more about Luoyang’s past, you can visit Luoyang Museum. In this magnificent building, historical relic shows the city’s yesterday glories. Or, you can go on the pedestrian in old town district, look around old fashioned Street scene. Luoyang was once a world class metropolis. Today Luoyang people are proud of local well known factories and research institutions. People always related to Luoyang with peony. The flower bloom in mid-April, with large corolla, bright colors. She is symbol of wealth and noble in Chinese culture . Luoyang is located in the center part of China, whose fertile soil, mild climate are suitable for peony . According to historical records, in Luoyang peony began to be cultivated in the Sui Dynasty, and became popular in the Tang Dynasty , at last win the praise "the finest peony in the world” Since 1983,Luoyang government held the Peony Festival in April every year. Which attracts tourists from around the world . Most foreigners coming to Luoyang would visit Longmen, where scenery is beautiful .Longmen mountains are like south gate of Luoyang. A river called Yi flows through the mountains .the stone is suitable for carving, and budist believe respect Buddha can bring better life in future, so some people built grottoes there .The earliest carving period is Northern Wei ,when Emperor Xiaowen moved capital to Luoyang at AD 493. After that , many dynasties continues this work .All these works last for more than 400 years. Finally , there are more than 2300 caves , about one kilometers away from north to south. 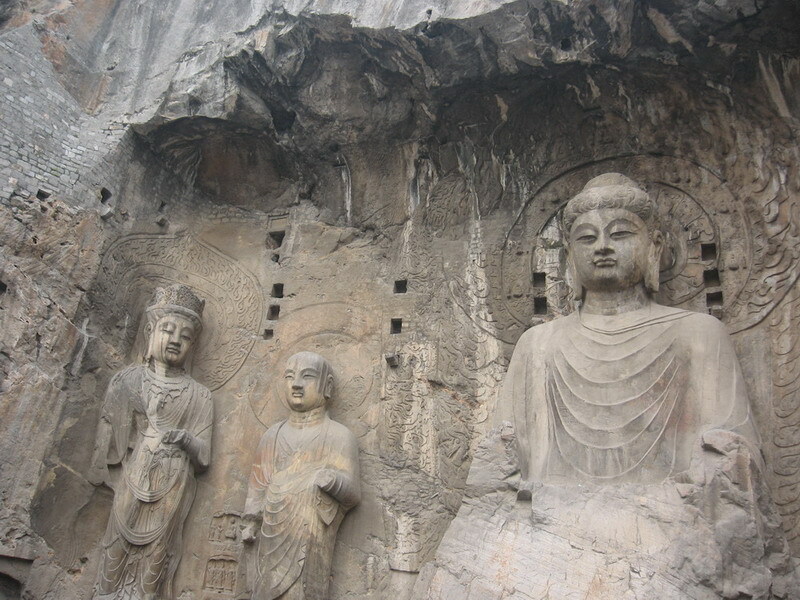 Most Longmen Grottoes were carved in the Northern Wei and Tang Dynasty ,amount for 90%. You can distinguish these grottoes with art style . The Northern Wei Dynasty people beleive thin is beautiful. Therefore, Buddhist sculpture is of skinny type. But Tang Dynasty people appreciate fat , so the Tang Dynasty Buddha sculpture had rounded face and shoulders . The largest sculpture of Buddha in Longmen Grottoes is Lu She Buddha,17.14 meters high, the smallest sculpture is only 2cm. Chinese Buddhist sculpture imported from India with the Buddhism, and India sculpture inherited Greece. These Grottoes are achievements of culture exchange between west and east at old times . After watching poeny and visiting Longmen, its time to eat Water Banquet .They are cooked with carefully selected materials, fine process, in total 24 diverse dishes , served in a specified order .It is said that Water Banquet emerge in the Tang Dynasty, because Luoyang is surrounded by mountains, less rain, not suitable for fruit planting, so people eat dietary soups there . At first, it is served for the high level class ,but as time goes , the ordinary people cook them in daily life . the Water Banquet featured meat smell dishes cooked with vegetables. The famous Luoyang Nest are made of turnip, vermicelli and other ordinary vegetables. Despite The city had been destroyed many times , peony, Longmen Grottoes , Water Banquet saved from the war ,because people dreams for happy life. In this sense , I agree they are be called three wonders of Luoyang.